Following the phenomenal worldwide success of the Fullmetal Alchemist anime, which also spawned a theatrical film, Fullmetal Alchemist: Brotherhood is a re-telling of the story from the manga point-of-view. Not to get confused by the title, this rework is totally independent, having no direct relation to the original 2003 anime, although both share the title Fullmetal Alchemist in Japan which can become quite confusing at times. Directed by Yasuhiro Irie and written by Hiroshi Ōnogi, this second anime adaptation was developed by Bones and is based directly on the Fullmetal Alchemist manga by Hiromu Arakawa, making it a truer, more accurate, adaptation of the popular captivating action adventure story. The story of Fullmetal Alchemist is centred on and around the mythical practise of alchemy, the ancient metaphysical science and mystical art of manipulating and altering matter by using natural energy: this act is called Transmutation. The mythical practice of alchemy is to create objects out of raw matter or to turn one object into another. Often viewed as magical or miraculous by those unfamiliar with the craft, alchemy is more so a form of science and, as such, is subject to certain laws and limitations, all of which fall under the concept of Equivalent Exchange, which states that in order to obtain or create something, something of equal value must be lost or destroyed. 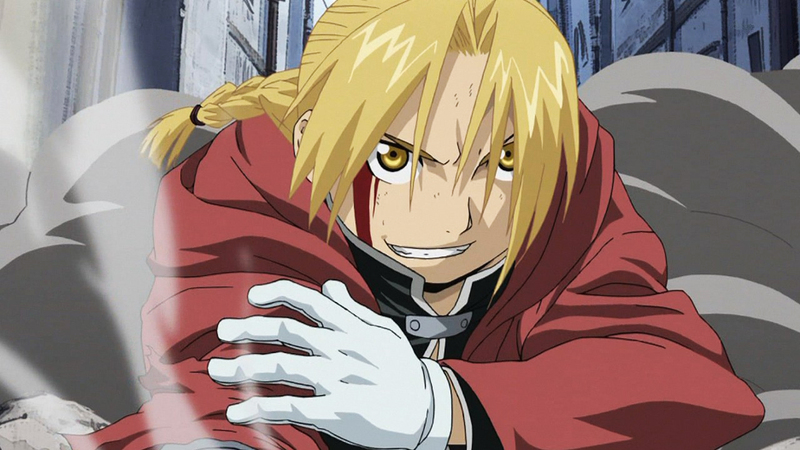 Edward Elric, ready for action in Fullmetal Alchemist: Brotherhood. After losing their mother, Trisha, to an incurable disease, two brothers, Edward and Alphonse Elric, use Human Transmutation, a dark and sinister form of alchemy, in an attempt to resurrect her. As the Law of Equivalent Exchange applies to the transmutation of non-living matter, devastating rebounds usually occur in Human Transmutation because human lives and souls are priceless according to the flow of the world. Unfortunately for the Elric brothers, the resurrection process tragically fails, and as a toll for using this dark forbidden alchemy, the older brother, Edward, loses his left leg while the younger brother, Alphonse, loses his entire body. To save his brother, Edward sacrifices his right arm and is able to affix his brother’s soul to a suit of armour. With the help of a family friend, the blonde beauty and mechanic Winry Rockbell, Edward receives metallic limbs known as ‘automail’ to replace his lost ones. With that, Edward vows to search for the Philosopher’s Stone, a rock that is foretold to give the user the ability to override the absolute Law of alchemy, Equivalent Exchange, to return the brothers to their original bodies. 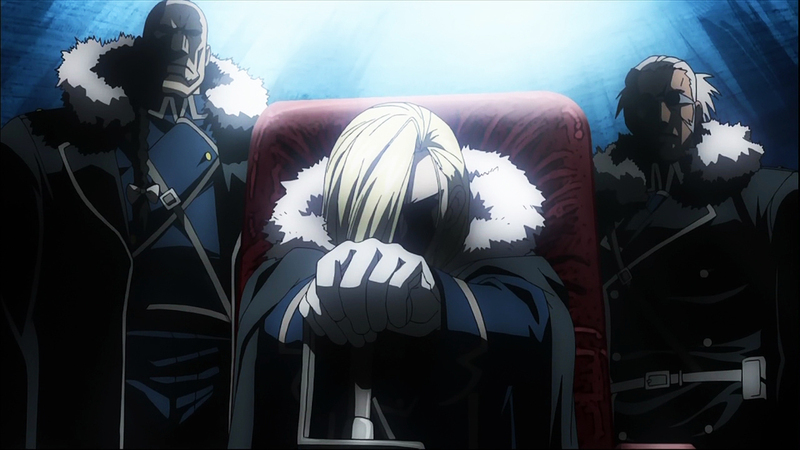 In search for the stone, Edward becomes a State Alchemist, one who uses alchemy for the military. Three years after becoming the youngest State Alchemist in history by achieving his certification at age twelve, Edward is now fully engrossed in the search for the Philosopher’s Stone. Appearing to be closer than ever in obtaining the stone’s whereabouts and discovering its origins, Edward soon discovers a sinister conspiracy taking him on a journey that will not only shake his very foundation but also threaten the lives of all who live in the country of Amestris. Set in a complex fictional world, Amestris is the country that serves as the principal setting of Fullmetal Alchemist: Brotherhood. Amestris is a Unitary State, with a population of about 50 million and a Parliamentary Republic type Government. Headed by King Bradley, also the Commander-in-Chief of the Military, holding the title of Führer, the country is composed by several former nations, quite diverse in culture and religion. The country is made up of five divisions and a Central Area, home of Central Command, the location of the State Military. Amestris is also completely bordered by surrounding countries, an integral one being Xing, which is separated from Amestris by the searing East Desert. The fictitious Amestris is rich with a detailed history and a vastly intricate backstory surrounding a Civil War, The Ishval Civil War, which began in the former province of Ishval and concluded with the extermination of the Ishvalan people, leaving the area devastated and its population massacred. Much of the Amestris’ history eventually ties together with the Elric brother’s search for the Philosopher’s Stone and the sinister military conspiracy they uncover in the process. As the title somewhat suggests, Fullmetal Alchemist is primarily a story about brotherhood, the Elric boy’s burden and the friendship and devotion they share for one another, but there are many other wonderful, tremendously humane and deeply profound characters on show. The estranged father of the Elric brothers, Van Hohenheim, a deceptively ancient and extremely powerful Alchemist is a major player, who despite disappearing suddenly during the boy’s infancy, returns during the course of the series in order to right the wrongs of his mysterious past. 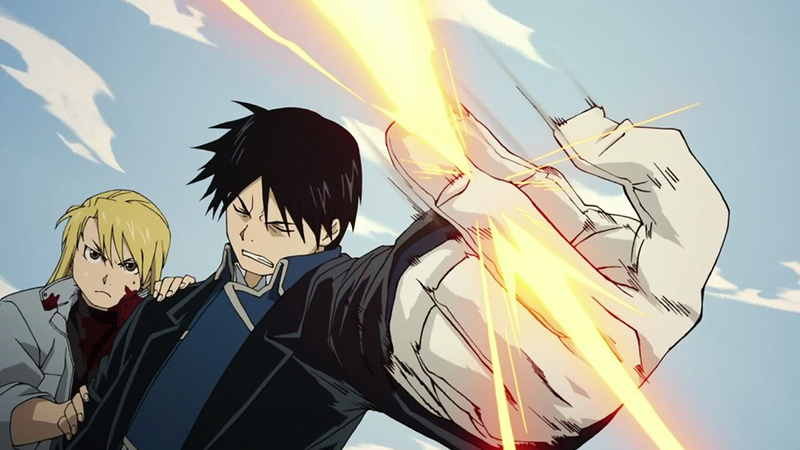 Then there is Roy Mustang, also known as the Flame Alchemist, who is a State Alchemist and officer in the Amestrian State Military. Labeled a ‘hero’ of the Ishval Civil War and Edward Elric’s superior officer, Colonel Mustang is a remarkably capable commander who becomes a major player in the series, as does female protagonist sharpshooter and firearms specialist Lieutenant Riza Hawkeye, who is part of Mustang’s unit. Originally introduced as a nameless lone serial killer and revolutionary who targets State Alchemists for his own brand of lethal justice for the revenge of his slaughtered people, the Ishvalan survivor Scar, initially known as the scarred man, also eventually becomes a chief character in the Elric brother’s life-altering adventure. There are also some very unique adversaries and antagonists in the series, somewhat original in design and frightfully terrifying in concept. The primary villains of Fullmetal Alchemist: Brotherhood are known as Homunculus or Homunculi, a term which stands for a mythological concept of an artificially created human, presumably brought into existence by certain means of alchemy. The concept of homunculi is regarded as no more than a farce or faraway fantasy for those who reside in Amestris as no individual or group of alchemists have come anywhere close to successfully creating such beings. Even so, alchemists have been forbidden by the Amestrian government to attempt or research in the transmutation of humans and State Alchemists have such a restriction as part of their creed. However, not only one, but several of these creatures have been created in arcane, sinister secrecy. 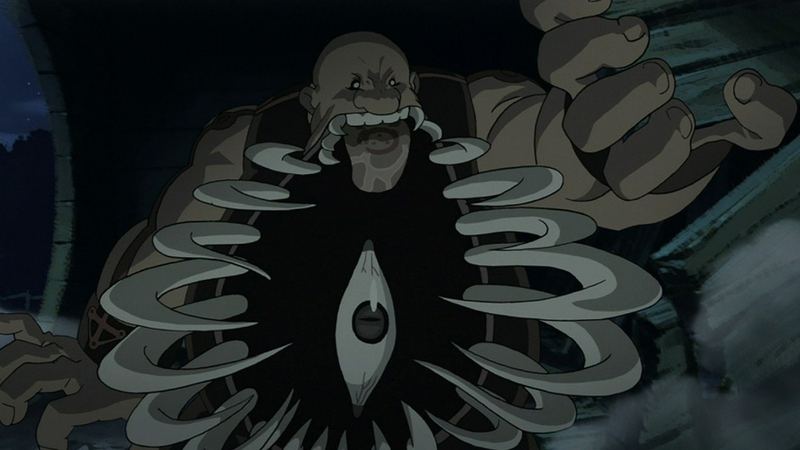 The Homunculus are the eight individuals who make up the main antagonistic group; these created humans, named after the seven deadly sins (Pride, Lust, Greed, Envy, Sloth, Gluttony and Wrath), along with their Father, are beings with incredible longevity, astonishing regenerative properties and a host of varied superhuman abilities making them a key threat and a major obstruction in the Elric brother’s search for atonement and restitution of their ‘human’ bodies. These beings are wonderfully envisioned and are created with such distinctive design and appearance, with a menacing presence and a powerful and passionate personality, making them a truly dangerous foe and incredible to marvel at when on screen. The Ice Queen and her Soldiers. Exploring controversial themes such as orphan treatment, consequences of guerrilla warfare and the amount of violent soldiers a military can have, author Hiromu Arakawa explores many social evils in the Fullmetal Alchemist manga that come out tremendously clear within the Brotherhood anime. This is a dark and violent glimpse into the wicked side of human nature, but within this heinous profound story lays a tantalizing tale about the unbreakable bond of family, love, dedication and perseverance, which pays off in every way possible. The characters and world are so rich in design, detail and emotion, drawing viewers into this inspired narrative from the get-go; the simple premise of two brothers trying to redeem themselves for a childhood mistake made in desperation is enough to capture the imagination and hearts of young and old alike. The Elric brother’s burden is embedded with such heart and emotion that viewers will instantly become hooked, rooting for their success and redemption, in the hope that these brothers will someday be reunited with their former bodies. Their story is so gracious and relatable, especially having lost my mother recently to cancer, that it strikes all the right emotional chords at precisely the perfect times. The sheer magnitude of this anime is quite evident as it attempts to answer some deeply weighty questions on human nature and the purpose of existence. Seeing Edward Elric grow from an innocent naive boy to a strong and honorable man, physically and emotionally, the brother’s journey is a lengthy one, with 64 episodes and 4 short OVA’s delving into some of the character’s exhaustive backstories, Fullmetal Alchemist: Brotherhood is certainly long, but there are enough revelations, twists and plot turns, and the introduction of exciting new characters, to keep things fresh and viewers hooked at every foreseeable moment. 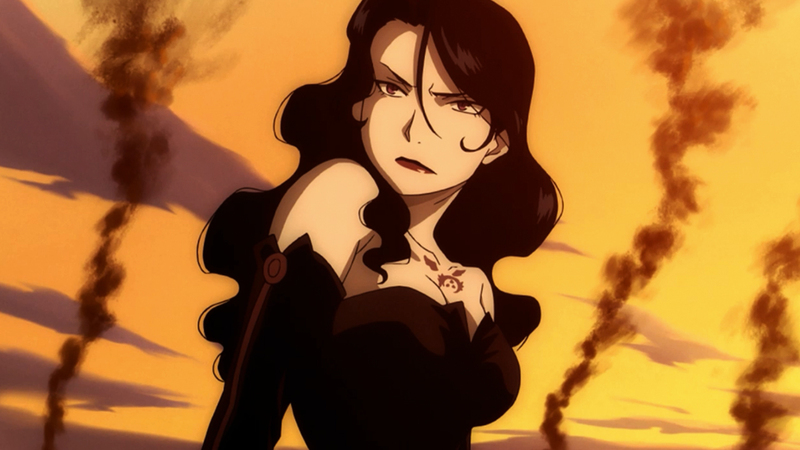 Some characters who enter just at the nick of time offering fresh identities, perspectives and emotional draws are May Chang, the youthful sweet seventeenth royal princess of Xing, Fort Briggs’ fearsome and merciless commanding Major General Olivier Armstrong, her dutiful and intelligent personal adjutant Major Miles and the abrasive mohawk-and-braid haired Captain Buccaneer who sports a claw-like automail right arm similar to that of Edward. The deeper you travel with our protagonists, the more emotionally invested you become in their story. This journey is filled with touching highs and devastating lows as for every uplifting juncture there are some sad, truly traumatic moments that will stick with viewers long after the anime is over. One such moment is the brief meeting with alchemist Shou Tucker and the pain, confusion and betrayal he causes, which is possibly one of the saddest, most traumatic anime moments of all time. Lust never looked so good! Visually, Fullmetal Alchemist: Brotherhood is a marvel as all the characters in this anime, both major and minor players, are so bold in design, from Edward’s red coat, long golden hair and automail arm to Alphonse’s metallic suite-of-armor, every element is quite iconic and distinguishable. The striking blue uniforms of the military, the daring bizarreness of the shadowy Homunculi and the sheer inventiveness and originality of the frightfully nightmarish Dwarf in the Flask, are all highlights in this anime’s astounding inventive construction. With beautiful tranquil county landscape, unforgiving snowy mountain ranges and war torn battle lands, the hand painted landscapes are just as unforgettable and striking as the authentic characters. There is a beauty to this story that is quite unique, unlike anything else seen in action-type adventure stories, as the Fullmetal Alchemist tale of Edward and Alphonse’s search for redemption will certainly stand the test of time. Rich in colour and detail, the animation is top-notch, as are the fierce and often brutal action sequences, superb character design, heartwarming soundtrack and everything else encompassed in this truly wondrous vision. The narrative is certainly twisted and dark but also humorous at times and filled with heart; a touching bittersweet scene near the anime’s finale at a train station between Edward and his childhood sweetheart, Winry Rockbell, both constantly in denial about their feelings for one another, will surely plaster a smile on viewer’s faces when the final credits begin to roll. Surely a massive undertaking for all involved, Fullmetal Alchemist: Brotherhood is a grand achievement in animation on all levels, technically, visually, dramatically, emotionally. Filled with intense action, raw emotion and honesty, Fullmetal Alchemist: Brotherhood succeeds in everything it sets out to accomplish and more so, being a masterful spectacle, epic both in scope and scale, that everyone needs to experience. A second viewing is probably almost mandatory to truly understand the complexity and detail of the narrative, but once you’ve concluded the journey with the Elric brothers you will surely feel accomplished and moved, knowing you’ve witnessed something truly unique and unforgettable.